So the wunderkind didn’t do it. Sebastian Vettel is not the world champion. He will never be world champion! Forgive me for getting carried away, but thanks to an unrelenting desire to stretch the championship out to the max, the title chase will now head to Japan. Thanks for the effort guys! Certain drivers had obviously taken a quick maths lesson before heading to Singapore in an effort to make sure the inevitable didn’t happen on Sunday. Apart from Vettel winning, that is something so predictable that we consider it to have had a bad day if he finishes second. You know you’re doing something right when second is a bad day at the office. So who showed himself off as a mathematical whiz kid? That would be Jenson Button, who now must be close to taking over the reins at McLaren with another display of control and measured aggression. Since the year started, Button has transformed as a driver, now feeling comfortable at the British team that title he won with Brawn is now bubbling, lying in wait under the composed surface. Where last year he was the first of the remaining top five to leave the mathematical chase for 2010, this year he’s the only other driver left in it. The race overall wasn’t as exciting as others that have preceded it, but it wasn’t without its moments. The start was not quite as eventful as Monza (no skittles this time), but yet again Mark Webber fell victim to his own bad start, although not as disastrous as they have been, and lost two places. Lewis Hamilton was another notable loser, an attempt to pass a tardy Webber that he backed out of, resulted in a 4 place loss, sticking him in eighth. Hamilton spent the day in recovery, recovery from a disappointing start, recovery from contact with Massa, and recovery from a drive through penalty. 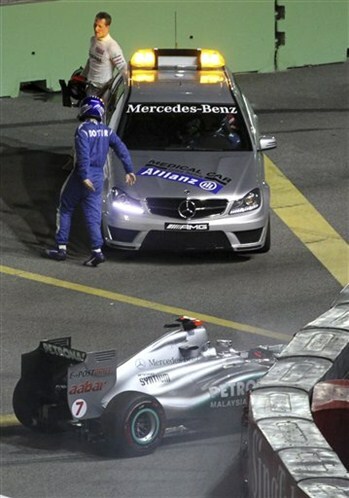 Without Massa’s puncture this would have been a racing incident, but with the damage and his reputation, the penalty was not altogether surprising. Either way his 5th place finish put him out of contention. Alonso and Webber also join him for the fight for second, as will Button after Japan. Vettel only needs a single point to be crowned the youngest double world champion, and a quick glance over his stats, that’s as close to 100% as you can get. However, he is not without an ability to make a mistake or suffer a mechanical failure. 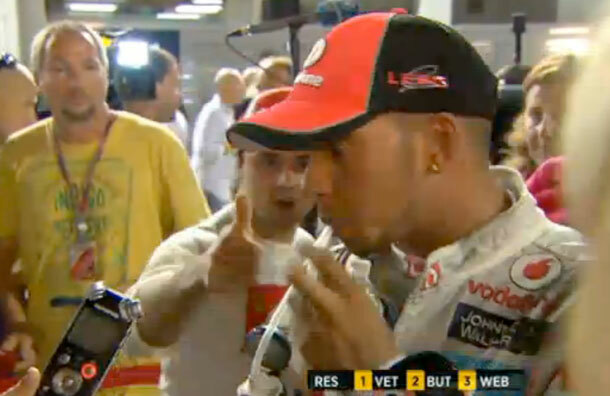 Bet Timo Glock wishes he didn’t put that bet on his fellow countryman to win it in Singapore. Disappointment was also felt down at the Renault garage, actually ’embarrassment’ was the operative word as both their drivers failed to make any impact on the race (apart from Senna on Perez), continuing their poor form from Friday. Made worse for them, but fantastically for Team Lotus, was Heikki Kovalainen splitting the duo. Big thumbs up for that! It wasn’t only Renault that felt back up against a wall, Michael Schumacher did that to himself. A series of events triggered by team mate Nico Rosberg running wide, left the 7-time champion on the back of Sergio Perez sooner than he anticipated, and as the rookie braked for the corner Schumacher misjudged it and took off over his right rear tyre. But where some falter, others soar. 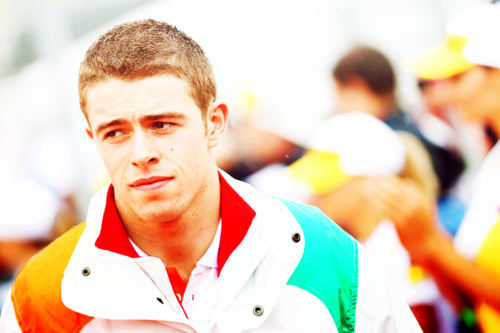 Vettel may have been the Singapore Flyer on the day, but for many the driver of the day was Paul di Resta (see below). An exquisite drive that should see him his spot on the grid secured for another year. This is tricky, Sebastian Vettel for complete dominance from start to finish, Jenson Button for delaying the inevitable, or Paul di Resta for a career best result. 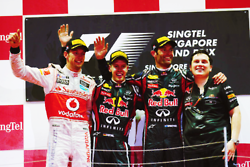 Paul di Resta had an exemplary race in Singapore, from start to finish. Without having raced here before and a badly interrupted Friday practices, he could almost be excused for a cautious race. But no, di Resta was not content with just getting to the chequered flag, they only one to start on the options in the top ten he made the strategy work and was only denied a 5th place finish by a late charging Lewis Hamilton. This is what happens when your upgrades work with a pair of drivers who can extract the best from them. 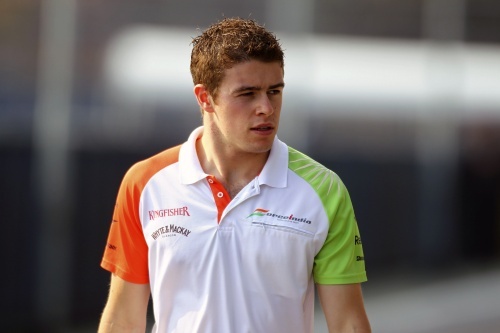 Paul di Resta’s stunning drive gave him his career best result and the great work from Sutil on an alternative strategy also paid off. The team’s collective efforts see them pull ahead of Sauber by 8 points and creep closer to Renault and shrinking the deficit to 22 points. Now with a more comfortable cushion in 6th, surely they must have their sights set on closing down the gap to Renault. 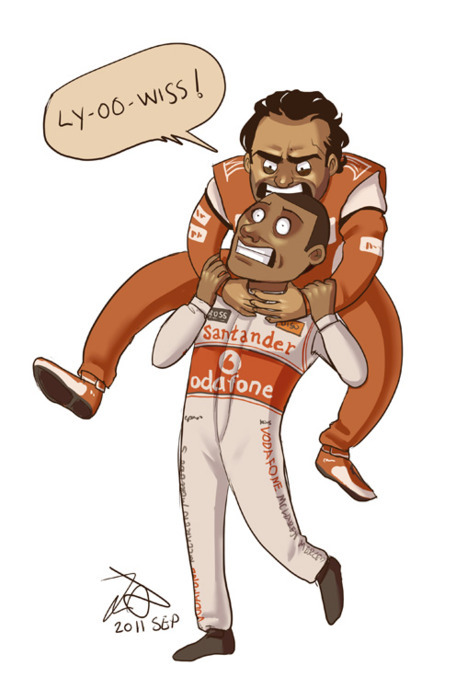 Oh Felipe baby, why did you have to lose your cool? The Brazilian’s day was undoubtably hindered by contact with Hamilton, but a childish act during press interviews has left him with few sympathisers. An aggressive pat on the back was followed by a sarcastic (thanks EJ) comment, “Good job, bro.” This has been a common theme running the entire weekend, Massa has always had something to say on Hamilton’s race craft when asked, “My thoughts are that, again, he cannot use his mind – even in qualifying.” Although, perhaps the biggest mistake is the constant ‘it’s not his fault’ from the McLaren camp, discipline works guys. A second thought was not given to this one, on race day he illustrated exactly why he’s such a strong contender for ‘rookie of the year’. At least there is one double champion this weekend. Fernando Alonso is quickly becoming a regular here, but only in a supporting role as the obstacle, although let’s be honest he does play it superbly. Only ever leaving just enough room and testing the other driver to the limit. In Singapore he was dueling with Mark Webber again, they waltzed, tangoed and cha cha-ed with each other through the pit stop periods, Alonso gaining the advantage with the undercut. 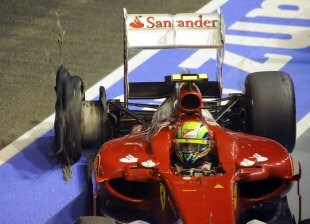 The Australian was then forced to pass Alonso a couple of times, the last one being reason for the acknowledgement. Taking advantage of a sleepy Alonso during the restart after the safety car pits, Webber gets brave on the brakes into the chicane and pulls off the move, with just enough room. 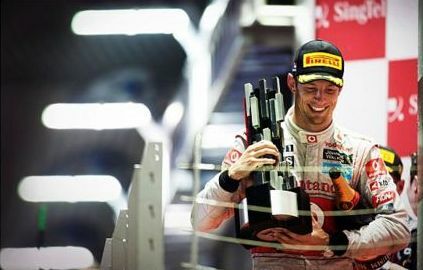 This left Alonso off the Singapore podium for the first time. All the love for illustration must be directed here, Lennymechs is on tumblr, it’s filled with F1 goodies and a must see. “If Mark has one of his special starts, I’ll be chuffed.” – Jenson Button having a little pre-race fun at Mark Webber’s expense…it would be funny if it wasn’t true. “Some people are already in their pyjamas.” Jake Humphrey remarked about Eddie Jordan’s distinctive attire. “Thanks Jake,” was the quiet response.